1. For the caraway Bath cakes: preheat the oven to 190˚C, gas mark 5. Brush the inside of a 9-hole madeleine mould with some of the beurre noisette and set aside. In the meantime, using a stand-up mixer fitted with a paddle attachment on medium speed, beat the egg and the golden syrup until thick and light in colour. Reduce the speed and sprinkle in the flour, both sugars, salt, caraway seeds and baking powder, continue to mix until well combined. Slowly drizzle in the cool beurre noisette and the milk. 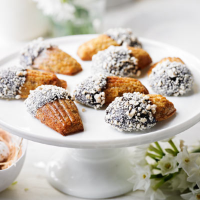 Pour the batter into the prepared madeleine moulds halfway up and place in the oven for approximately 10 minutes. Remove the tray from the oven and cool on a cooling rack. 2. For the chocolate crumb: add the sugar and 75g water to a large pan, place over a medium high heat and allow the syrup to come up to 150˚C. Remove from the heat and add the white chocolate and continue to whisk. The chocolate will become foamy at first but keep whisking until it crystallizes. Pour the crystallized chocolate onto a tray lined with parchment and allow to cool completely, crushing any clumps once cool. 3. To finish: melt the chocolate sauce according to pack instructions, allow to cool slightly. Using a spatula, cover half of the Bath cakes with a layer of the chocolate sauce. Sprinkle some of the chocolate crumb on top. Chill until ready to serve. To make the beurre noisette: melt unsalted butter over a gentle heat, whisking continuously, until the solids turn golden brown and smell nutty. Remove from the heat, strain the butter through a coffee filter and store in the fridge.